Ilheus brings together the best of two worlds: it’s both urban and relaxed at the same time. On one side there is the city and on the other side there are exclusive beaches, with houses facing the sea. 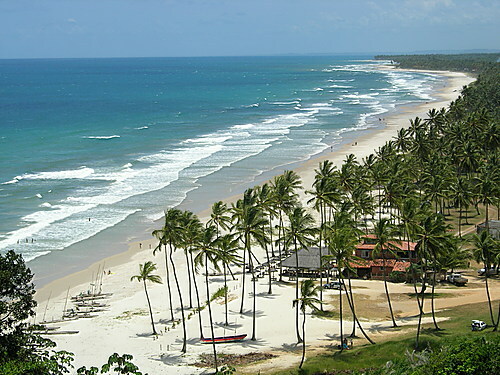 It is the county with the most extensive coast line of Bahia. The northern beaches are the most famous in that region. From Ilhéus to Serra Grande there are 35 kilometers of beaches with different names along the way: Ponta da Tulha, Coqueiros, Luzimares and Sargi; several of the houses you find at Bahia Homes are there. With its own airport, Ilhéus is the gateway to the region of the Cocoa Coast, in the southern Bahia, worldwide known for inspiring some of Jorge Amado’s novels, a famous Bahian writer, such as “Gabriela”, “Clove and Cinnamon” and “The Endless Lands”. São Jorge dos Ilhéus has historical importance thanks to its nearly 500 years of existence. In the ancient village of São Jorge dos Ilhéus you can find the stamp of Portuguese colonization in its architecture, such as the colonial houses. This includes the beautiful public building such as the Palace of Paranaguá, a copy of the Catete Palace in Rio de Janeiro. Ilhéus is full of attractions and beautiful beaches as Avenida, Ponta da Tulha, Sul, Norte, Batuba e Olivença. All of them offer unspoiled nature, white sand, calm water and lots of exclusivity. Check the houses available for renting in Ilhéus. Check the houses available for selling in Ilhéus.